Storage vessels for compressed hydrogen gas should be designed, constructed, tested, and maintained in accordance with applicable codes and standards. Mobile vessels - Title 49 of the Code of Federal Regulations (CFR), which covers the transport of hazardous materials. Permanently installed storage vessels should be provided with substantial noncombustible supports. Hydrogen cylinders and storage tanks should be stored outside at a safe distance from structures, ventilation intakes, and vehicle routes. This applies even while in use. 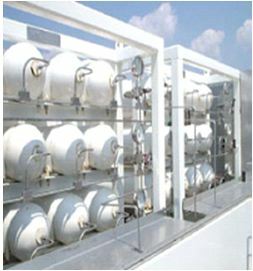 Best practices call for compressed hydrogen bottles supplying a manifold to be located outside, with welded lines to connect to indoor equipment. When it is necessary to locate storage inside, the provisions in NFPA 55 should be followed. Tube trailers are not equipped with automated emergency shutoff valves.